The roar of support from the public has been equally deafening — nearly 5.6 million Facebook fans, 836,000-plus Twitter followers, 89 million total YouTube views. And with Triple F Life: Friends, Fans and Family, Waka’s second official album via Warner Bros. (there are also 25 solo and collaborative mixtapes, plus the 2011 Gucci Mane duo album Ferrari Boyz), he’s raising the stakes. Nasty, cutting, triple-time raps and reflective storytelling now balance out his anthemic gut-punchers and strip-club paeans, with production primarily by longtime friend Joshua Luellen, a.k.a. South Side, who worked with Luger to craft Waka’s signature sound. It’s the album his fans were hoping he’d make — no corny rock-band conceits, just bigger, broader, faster, stronger. It reflects where he’s been and where he’s going. And if the reaction in Paris is any indication, Waka’s on the verge of a worldwide breakthrough. All over the City of Light, he’s quickly recognized — on the street outside the hotel, at the party, the club. Being a Southern gentleman, Waka stops to chat with each group of fans, posing for camera-phone photos, but also asking what they’re doing here, what spot’s the most poppin’. They’re from Paris, London, Guadeloupe, Côte d’Ivoire, and they know his fight lyrics, his foreboding beats, his statements of supremacy. 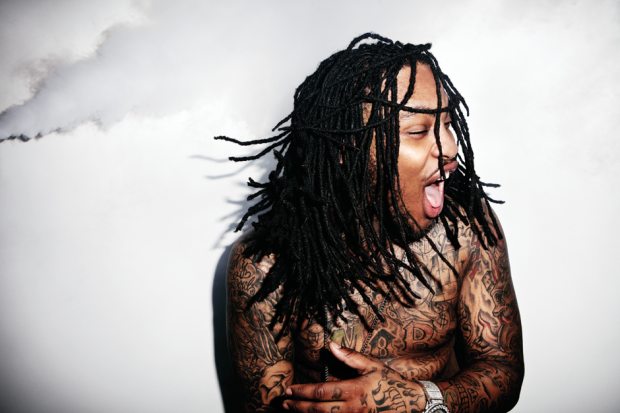 Most of all, they know his trademark, Tarzanian scream: Waka Flockaaaaa! 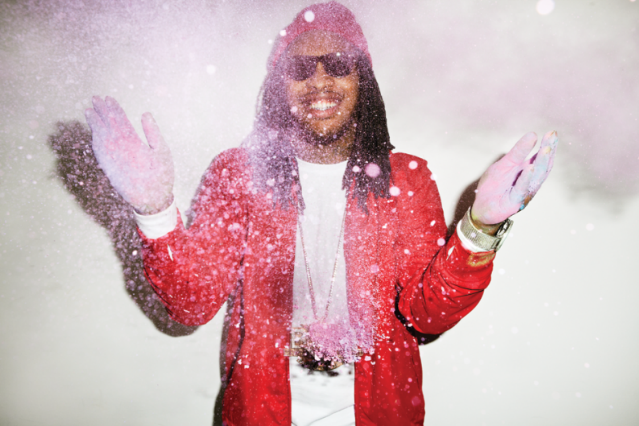 See what happened when SPIN let Waka take over the magazine for one fateful coffee break. Waka Flocka Flame, born Juaquin Malphurs in 1986, grew up on the south side of Jamaica, Queens, raised collectively by his grandmother and aunts, a sweet-faced kid who was a little too rowdy for his own good (“a bully,” says Tyquam Alexander, one of Waka’s five brothers — three older and two younger). In fifth grade, he got into a scuffle with his younger cousin; and after being put on punishment, he called his mother, Debra Antney, asking if he could come live with her in Riverdale, Georgia, a low-income, primarily black neighborhood south of Atlanta, where she’d been intermittently working. (Waka’s father had been in prison most of his son’s life, and died after being released.) Sensing Waka’s exasperation, she agreed. Initially, it was hard to adjust to the slow-flowing attitudes and languid drawl of kids in Georgia, but within a year, Waka had become so acclimated that it was as if he’d been born there. “Kids just wanted to be kids in Atlanta,” he explains at his Paris hotel, grabbing a complimentary gummy alligator candy. “That’s back when we had Freaknik in Georgia, that’s Atlanta Atlanta. Like, Hey shawty! Whassup, folk! It was really Georgia people living in Georgia. That’s when I loved it. It wasn’t cool to be country.” He’s talking about gentrification, and the proliferation of people who “just moved in and built on the city,” because country has, in fact, become cool. This has just as much to do with Atlanta becoming a music-industry nexus as with the fetishization of Southern style, but for Waka, the place is just not the same. Waka is clearly fond of those early years down South — the twanging inflections in his raps signal that affinity — because it was a period of innocence, before his life tragically changed. One night in 2000, when Waka was 14, he was looking after his younger brother, ten-year-old Rahleek. His brother asked if he could leave to help a friend with his homework. Waka said okay, so long as he made up his bed to look like he was asleep. But while Rahleek was riding his bike over to his friend’s house, the brakes went out. He was struck by a drunken driver.